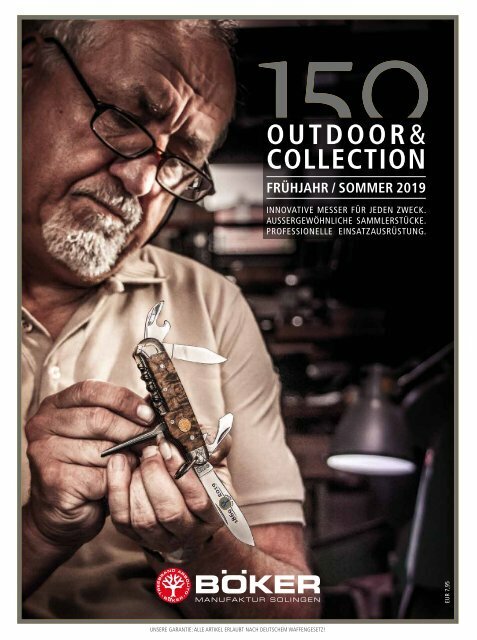 OUTDOOR& COLLECTION FRÜHJAHR / SOMMER 2019 INNOVATIVE MESSER FÜR JEDEN ZWECK. AUSSERGEWÖHNLICHE SAMMLERSTÜCKE. PROFESSIONELLE EINSATZAUSRÜSTUNG. EUR 7,95 UNSERE GARANTIE: ALLE ARTIKEL ERLAUBT NACH DEUTSCHEM WAFFENGESETZ! Seite 4 und 5: MAGNUM COLLECTION 2019 & N 019 ECK. ARBOLITO 1 | El Gigante Ebenholz. ARBOLITO 1 | Arbolito Drop Point. 1 | Böker Plus Damascus Gent 1. 1 | Böker Plus Lateralus Steel. 1 | Böker Plus Tactical Caracal. 1 | Böker Plus AKS-74 Spearpoint. 1 | Böker Plus AK-101 Gray Plain. 1 | Böker Plus Gemini NGA Coyote. 1 | Böker Plus Bushcraft Kormoran. 1 | Böker Plus M3 Trench Knife. 1 | Police 4. € 311,- 2 | Police. 1 | R.E.D. € 189,95 2 | Feather. 1 | G5 Metamorph MK.II Soft Grey. 1 | ZX-8. € 63,95 2 | Gavilan. 1 | Magnum Advanced All Black Pro. 1 | Magnum Li´l Friend Arrowhead. 1 | NU32. € 44,95 NEU 2 | HC65.